Hi friends! I hope you had a great weekend! We had a very low key weekend and I'm hoping that I got enough relaxation to last me through the week. 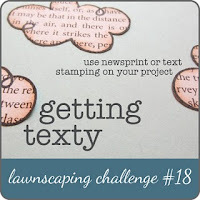 Are you all ready for a new Lawnscaping challenge? 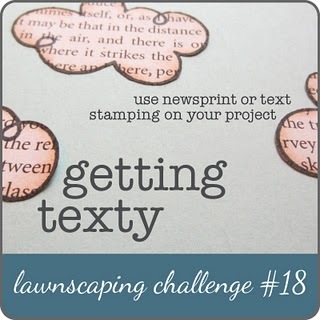 This challenge is Getting Texty: using newsprint or text on your project. Isn't that a fun one? I had to put on my thinking cap for this one but it's such a fun challenge! This challenge sponsor is Lawn Fawn Stamps. 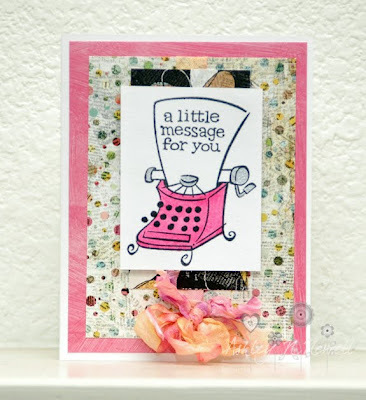 You know how we LOVE love love Lawn Fawn stamps! The prize for this challenge is one stamp set of the winner's choice! How's that for awesome?! Here's my card for this week. I used Just My Type from Lawn Fawn and some Basic Grey Out of Print paper. This card is based on Sketchy Thursday 147.
love the pink typerwriter:) happy monday! Hi Ashley. Cute card, I like that type stamp, it goes perfectly with the BG paper. This is gorgeous, Ashley! Love that ribbon. It adds such a feminine touch. Cute, cute, cute! I love this image. Your ribbon is truly yummy. It's like icing on the cake to your amazing card!! So awesome to have you play along this week Ashley!